The research network was founded on August 31, 2007 in Lujavv’r (Lovozero), Russia. It was called Poga – the language survival network. The network has at this point no formal membership rules. The persons who attended the conferences in Lujavv'r and Inari and the few who were invited and unfortunately could not join us form the membership at this point. The network has the general aim of supporting comparative research on various aspects of language maintenance, revitalisation, cultural survival and rights of minorities and indigenous peoples both in the Russian Federation and the European Union. The network is multidisciplinary and the goal is to enhance projects which make use of at least of two different disciplinary perspectives. 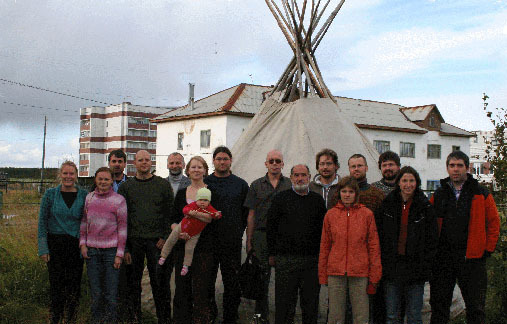 poga founder members in Lujavv'r (Lovozero) on August 31, 2007. In its first meeting, the network set both short term and long terms goals. Short term goals include the translation of a practical guide to language revitalisation (in Russian), and an edited volume on the status and situation of language minorities in the Russian Federation to be published both in Russian and English simultaneously. Several proposals were discussed relating to long term cooperation with concrete comparative projects e.g. focusing on language nests or litigation on the basis of indigenous peoples’ rights to lands and natural resources. Furthermore, comparisons with the Inuit in Canada (who suffer severe consequences of apparently neutral governmental policies which are aimed at ‘helping’ the Inuit to modernize) and e.g. the Oneida in upstate New York (who can finance their own revitalization) would provide for an interesting comparison with those Russian indigenous groups. Long terms plans also include educational courses for lawyers in human rights and litigation, offering special measures to educate law students with indigenous backgrounds and the organization of interdisciplinary summer courses for students of law, social linguistics and social anthropology with a focus on minorities and their rights. The network members seek actively funding for translation and research activities. Currently, the network is coordinated by Heiko Marten (Institute of Germanic and Romance languages and cultures, Tallinn University, Estonia), Michael Rießler (Department for Scandinavian Studies, University of Freiburg, Germany), Janne Saarikivi (Department for Finno-Ugrian Studies, University of Helsinki, Finland) and Reetta Toivanen (Centre for Research in Ethnic Relations and Nationalism and Centre of Excellence in Global Governance Research, University of Helsinki, Finland).